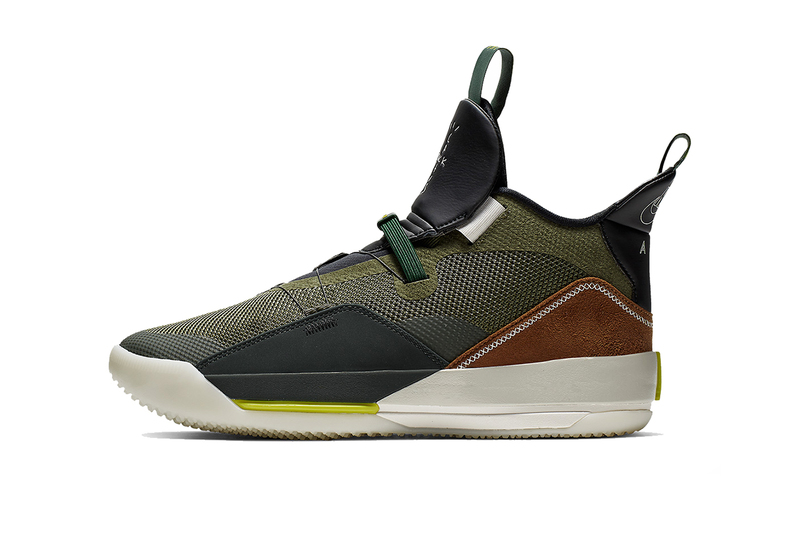 UPDATE: Shared via Nike SNKRS, Jordan Brand will be launching the Travis Scott x Air Jordan 33 on February 14 with a retail price of $185 USD. The forthcoming release follows last weekend’s Travis Scott x Air Jordan 1 High OG “Travis Scott” shock drop that took place during the GRAMMY Awards. Let us know if you plan on copping and stay tuned for more information regarding the latest installment from La Flame and Jordan Brand. January 29 - Since the release of the Travis Scott x Air Jordan 4, fans of the Houston-representative have been wondering what would be the follow up from La Flame and Jordan Brand. Aside from his forthcoming Air Jordan 1 with a flipped Swoosh, we’ve seen a few hints at a collaborative Air Jordan 33. Today, clean shots of the its “Cactus Jack” colorway have surfaced ahead of a potential launch. The Travis Scott x Air Jordan 33 NRG is rumored to arrive during this year’s NBA All-Star weekend taking place in mid-February. Stay tuned for additional information and let us know if you favor this iteration over the Travis Scott x Air Jordan 4.